Sometimes, it’s Saturday and I’m able to take my time taking awesome pictures for the blog, complete with props and natural sunlight and cute dishes. Other times, I have been trying to make a dish for two weeks but haven’t found time; had to toss ingredients out at least once because they went bad before I could use them; had to hussle out of the kitchen cause my roommate needed it to make dinner with his friends; had to take pictures in front of old plastic-ed windows in the early morning gray-ness because it’s snowing; and the recipe I’m photographing is really nothing but a pile of orange and brown (albeit delicious) mush. Can you guess which situation this delightful shephard’s pie recipe falls under? 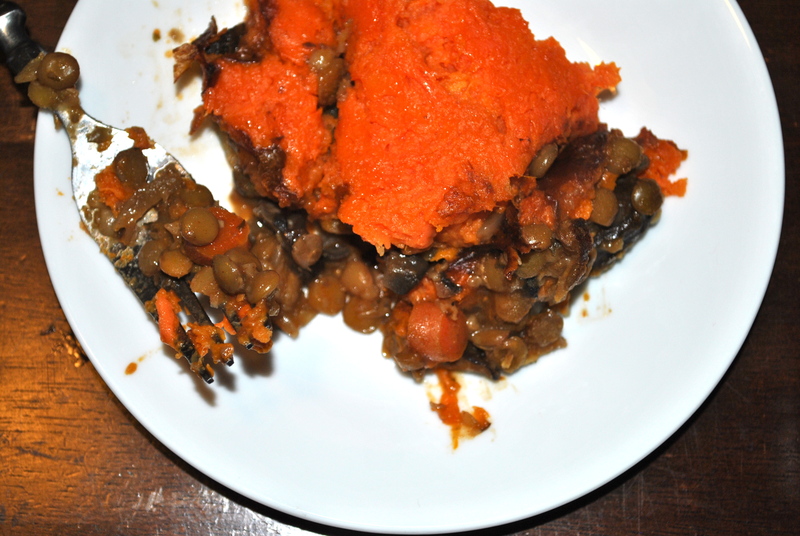 Despite the fact that it may win the award for the most unpleasant pictures on the site, the recipe is actually really delicious, which is a lot coming from me. Shephard’s pie used to be my one freebie at dinner. You know, you had to eat what Mom makes except for your one freebie meal because she knew you genuinely hated it. Shephard’s pie was my freebie (until I went vegetarian, then I got a special meal each night. Go me!). But since this recipe has exactly none of the ingredients that my mom’s shephard’s pie had, it shouldn’t be a big surprise that I like it better. Preheat the oven to 400°F. 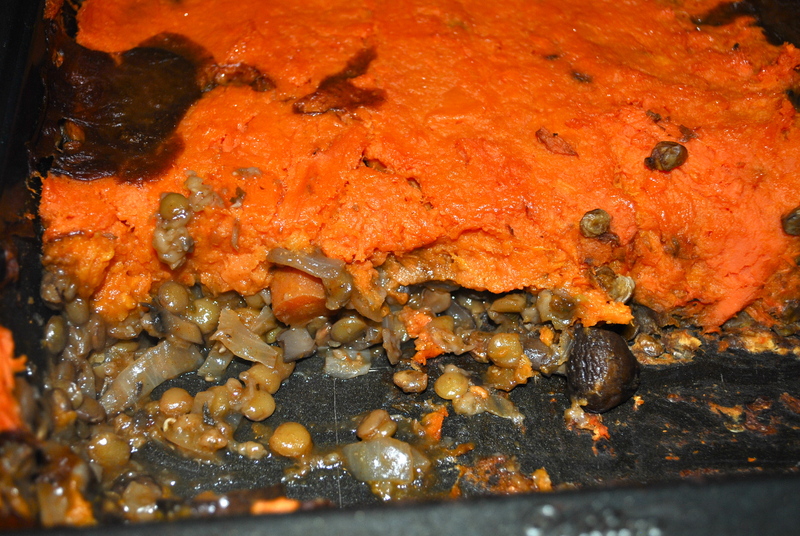 Prick each sweet potato several times with a fork and place on a baking sheet. Roast for 45 minutes to 1 hour, or until very soft to the touch. Set aside to cool. In a medium pot, combine the lentils, oats, bay leaf and salt with 5 cups of water. Bring to a boil and lower heat. Simmer uncovered for 15-20 minutes or until lentils are soft but not mushy, stirring occasionally to keep the oats from sticking to the bottom of the pot. Discard bay leaf and drain mixture into a colander or sieve. While the lentils and oats are cooking, finely chop half of the mushrooms and set aside. Cut the remaining mushrooms into quarters. Warm the olive oil in a large pot over medium-high heat. Add the quartered mushrooms and a pinch of salt and cook until browned and soft. Add the chopped mushrooms, onion, carrot, celery and garlic and cook, stirring occasionally, until onions are soft and translucent. Lower heat to medium and add the lentil and oat mixture, followed by the vegetable stock, wine, tomato paste, soy sauce, paprika, and parsley. Taste and add salt if needed. Simmer mixture for 5 minutes. Remove from heat and add a few grinds of black pepper. Preheat oven to 350°F. 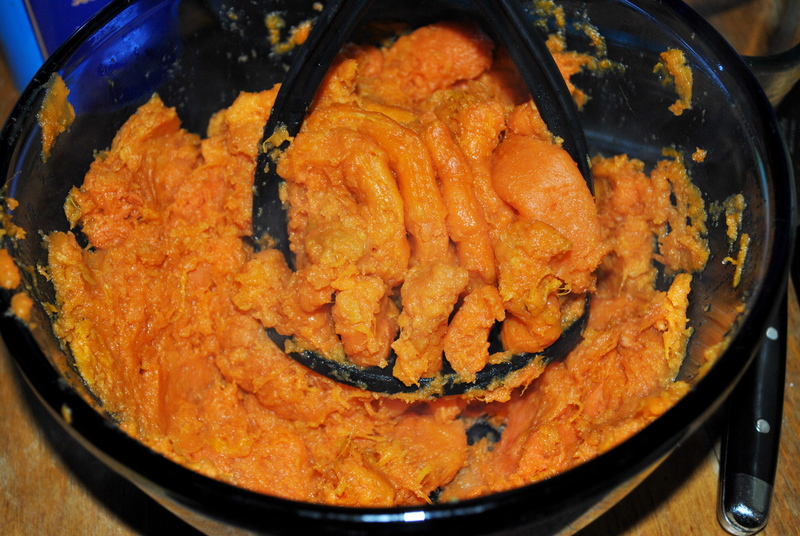 Peel sweet potatoes with your hands and place in a medium bowl. Use a fork to mash them into a smooth paste and season to taste with salt and pepper. 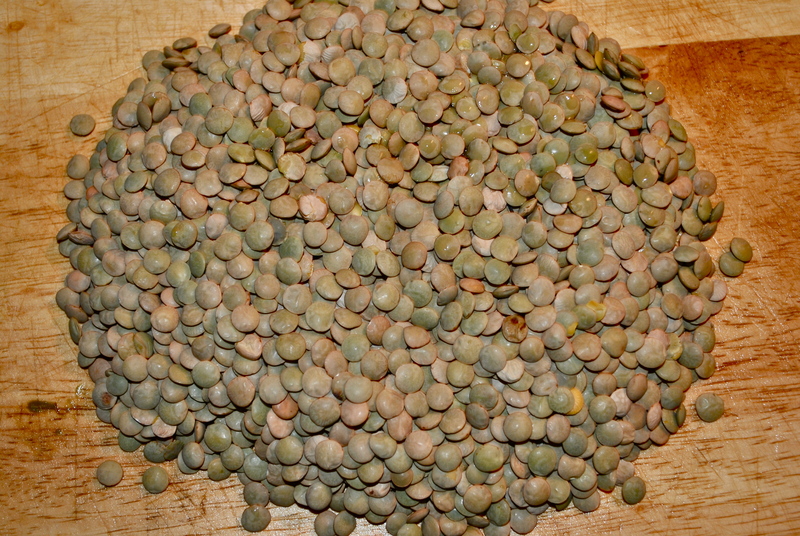 Evenly spread the lentil mixture into a 9×13-inch baking dish. (For thicker layers, use a 9×9-inch pan.) 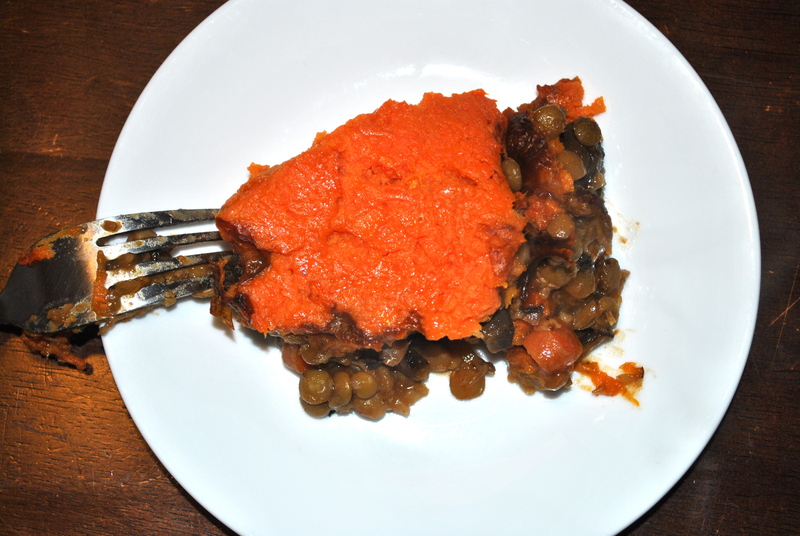 Spoon the sweet potato mixture on top and smooth with a spatula. Bake for 30 minutes, or until the filling is bubbling at the edges. *Note: The original recipe called for 5 medium sweet potatoes but that didn’t even cover 3/4 of my shephard’s pie in a 9×13 pan. I would suggest buying and roasting 6. Start by mashing 5 and if you need more, mash the 6th. If you end up not using that 6th roasted sweet potato, you can always cube it and add it to a salad or have it it for lunch. Bonus points for me: Shephard’s Pie is considered an Irish cuisine on wikipedia. Which means that I am over a week early with presenting you with a St. Patty’s Day dinner idea. Just add a Guiness (Extra Stout is vegan according to Barnivore.com) and your done. More St. Patty’s day recipes to come!